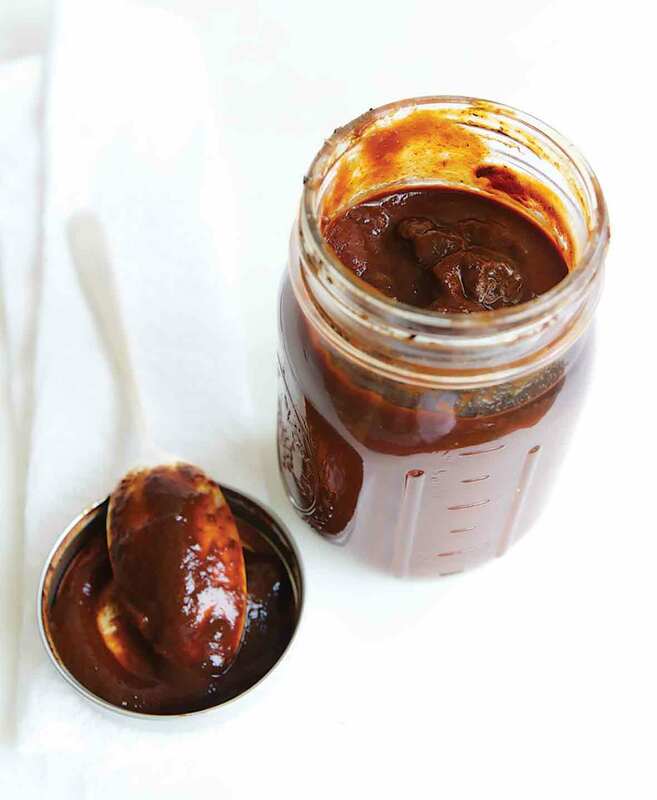 Adobo sauce is probably best known for being the sweetly earthy sauce that bathes chipotle peppers in a can, although it has a ridiculous number of other uses. 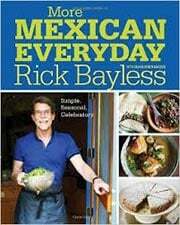 It’s an authentic Mexican pantry staple from Rick Bayless which has no substitute. Here’s how to make it at home. We’re all probably most familiar with adobo sauce as the sweetly earthy sauce that bathes canned chipotle peppers. But it as far, far more uses than that. Use it as a marinade for fish, scallops, shrimp, chicken or pork destined for the grill or skillet. Stir a little into rice as it cooks. Mix with ground pork for a quick substitute for Mexican chorizo. Add to pretty much any brothy soup for depth and interest. Season sautéed greens or potatoes. Use in a simple vinaigrette to drizzle over a salad. 1. Scoop the chile powder into a blender or small food processor. In a medium saucepan, bring the water to a boil. Pour the hot water over the chile powder, loosely cover the blender or secure the top of the processor, and pulse to create a smooth slurry. Let cool. 2. If you prefer a straightforward and quick adobo, toss the peeled garlic cloves in a microwavable bowl, add enough water to cover, and microwave on 100% for 1 minute. Drain. If you prefer a sweeter, toastier flavor to your adobo, toss the garlic cloves, still in their papery skins, in a dry skillet and place over medium heat, turning them regularly until they turn soft and blotchy black, about 15 minutes. Let cool and then remove and discard the papery skins. 3. Toss the garlic in the blender along with the cinnamon, pepper, cumin, oregano, vinegar, and salt and process until a smooth purée forms. If necessary, stir in some water, a splash at a time, until the adobo is the consistency of barbecue sauce. Transfer the adobo to a pint jar, screw on the lid, and store in the refrigerator for up to a couple months. If you prefer to work with whole dried ancho chiles rather than ancho powder, simply remove the stems and seeds from 4 medium dried ancho chiles and toast them in a dry skillet over medium heat for a minute or so, until very aromatic. Transfer to a plate to cool and then tear the chiles into small pieces, scoop into a blender, and proceed with the recipe, blending the dried chiles instead of the chile powder with the boiling water as directed and then adding the remaining ingredients. This adobo sauce recipe is exactly as advertised. Quick, easy, and delicious. I don't really think that dried anchos are mysterious or hard to find (in fact, they're probably easier to find than ground ancho powder), but using the ground chiles really does shorten the prep time as there's no soaking to deal with. And the boiling water technique works well to produce a smooth sauce. The adobo sauce makes a great marinade. Vegetarians, take note: you can freeze some tofu, then thaw it and pulse in a food processor until coarsely ground. Sauté the ground tofu with some of this adobo, and you will have a vegetarian chorizo that tastes much, much better than the soy-based chorizos you can buy in the store. I swear that condiments speak to me. My fridge is proof! I've never found an unusual condiment I could resist. One taste and you'll hear it, too. it's shouting to be used with tomatoes in shakshuka or ranchero sauce, begging to be mopped over pork chops or flank steak, talking its way into your baked beans, even cozying up to your squirt of ketchup or mayo on your sandwich. Think I'm crazy? Take a taste! This adobo sauce recipe is easier than most—it's largely a dump-and-blend situation. We added about 3 tablespoons of the adobo sauce to a pot of rice pilaf with shrimp and were rewarded with a rich garlic and chile flavor without any heat. My only gripe is that I'm directed to boil water on the stove AND in the microwave. Next time I'll boil the 1 1/4 cups water in the microwave in a Pyrex, dump it over the chile powder, then throw the garlic in the empty Pyrex, add water to cover, and put it back in the microwave. This quick red chile adobo sauce was easy to prepare and could be used for quite a few things. I made it into a vinaigrette and served it over salad. I added it to plain Greek yogurt and used it as a quick veggie dip. I marinated some pork chops in it with good results. And I also used some to spice up a pot of chili. Adobo Sauce Recipe © 2015 Rick Bayless. Photo © 2015 Christopher Hirsheimer. All rights reserved. All recipes and photos used with permission of the publisher.